Beginner Quilling Kit — Get Creative with Paper! We've added a new Paper Craft Kits category to the store. Our goal is to fill this category with a collection of creative project kits that make paper crafting easy & fun! We're starting off this section with a nice selection of Quilling Kits from Quilled Creations. Quilling is a twirled paper art form where strips of paper are curled using a quilling tool and then joined together to create decorative designs. The Beginner Quilling Kit from Quilled Creations is the ultimate starter kit for beginners! This quilling kit includes all the essential quilling tools, supplies & instructions you need to learn create your own quilled paper art. Kit includes quilling needle, slotted tool, 1/8" quilling paper, fine-tip tweezers, circle size ruler, craft glue pen, and instruction booklet. You'll learn basic quilling techniques and follow step-by-step instructions for creating a variety of fun & simple designs for beginner quillers. 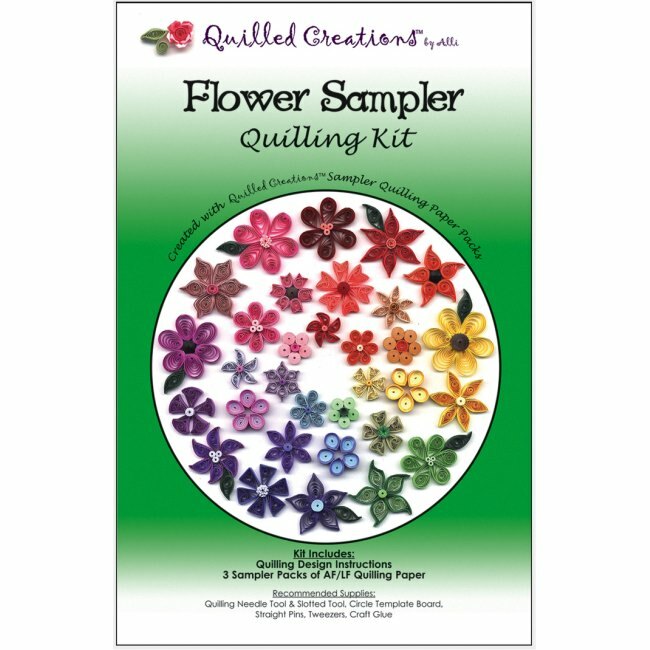 A sampler pack of cards, envelopes, and tags are also included for creating your first quilling projects. Another very nice feature of this kit is that all of the quilling tools & supplies are stored in a convenient organizer case! 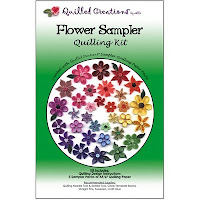 The Flower Sampler Quilling Kit includes quilling paper and design instructions for creating a variety of flowers in a rainbow of colors. Use your finished paper flowers as embellishments for hand made greeting cards, scrapbook pages and other crafty applications. 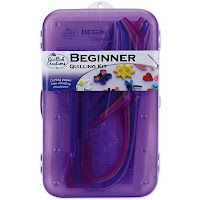 The basic quilling tools & supplies described above in the Beginner Quilling Kit are required for this kit. 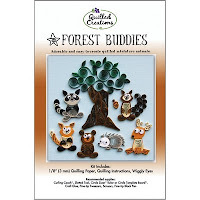 The Forest Buddies Quilling Kit includes quilling paper, wiggly eyes, and design instructions for creating six adorable forest animals and a woodland tree. In addition to needing the basic quilling tools & supplies, Quilled Creations recommends the use of a helpful tool called the "Curling Coach" for this kit. The Curling Coach makes it easier for quillers to hold and roll the large tight circles needed to create these miniature paper animals. We'll have the Curling Coach in stock soon, so you'll be able to easily add one to your order. 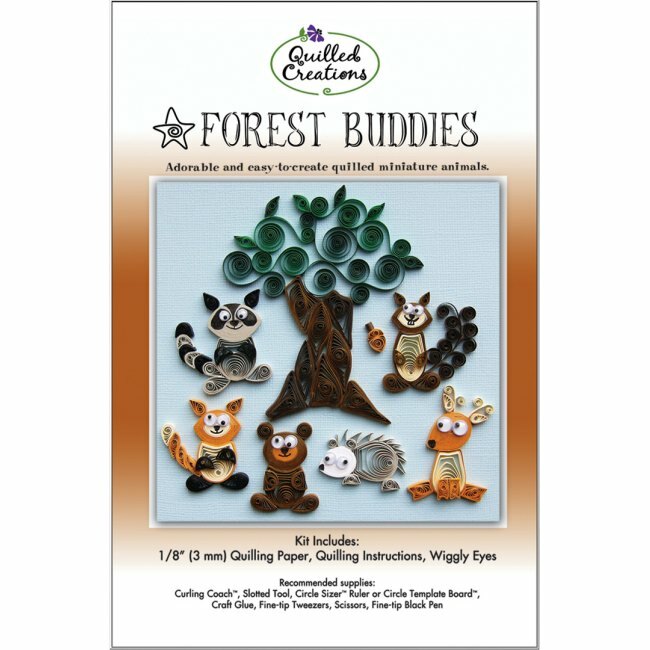 Don't miss the Jungle Buddies Quilling Kit with quilling paper, wiggly eyes, and easy instructions for creating six delightful jungle animals! Visit the Paper Craft Kits section for complete details on our new quilling kits. We'll be adding new quilling kits & other paper craft projects soon, so be sure to check back for new product arrivals. At Weekend Kits, we're always on the look-out for exciting new Art & Craft Kits that help make learning a new craft convenient, easy, and fun for beginners & experienced crafters. Visit us today and be ready to Get Creative with Paper on your next Weekend at Home! 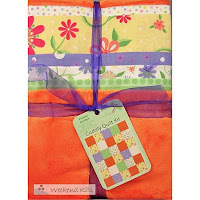 Baby Quilt Kits — Bright Colors & Fun Themes! Visit the Baby Quilt Kits section of the store to see our full selection of baby quilt kits in a variety of bright colors & fun themes! Cuddly Quilt Kits from Fabric Editions are coordinated fabric collections with simple quilt patterns and easy instructions. Each baby quilt kit contains a variety of fabric types, including quality cotton, soft flannel, and textured plush. There's enough material to complete the quilt top and backing. To ensure adequate yardage, it's important to NOT pre-wash the fabrics. The quilt patterns are simply pieced designs, making them an ideal quilt kit for beginners looking for a easy quilting project. They're also a quick & easy quilt project for experienced quilters to make a soft & cuddly blanket for baby! It's recommended that you read through all of the instructions prior to starting your baby quilt project. Beginners may want to follow through step-by-step, while experienced quilters may prefer to use alternate quilting methods. The Cuddly Quilt Kits don't require the use of batting, but many quilters prefer to add batting for extra warmth & comfort. If you're a beginner quilter and would like to add batting to your baby quilt, read on to learn about a helpful on-line resource with easy quilting instructions. Makes sure to stop by the Baby Quilt Kits section to see our complete selection of easy baby quilt kits. You'll find bright new colors perfect for baby and fun fabric themes for kids of all ages! I recently found a very nice quilting tutorial for making a simple baby quilt on the Cloud 9 Fabrics Blog. 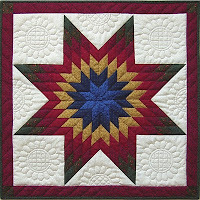 The post, called the 5x5 Quilt Tutorial, includes step-by-step instructions with great photos. I hope beginners find this to be a useful quilting resource. Winter is the perfect time of year to plan some creative craft time at home. Weekend Kits offers a full selection of Art & Craft Kits for adults, teens, and children. You'll also find many of the Craft Supplies you need to complete your project kits - all in one store! Stop by today and be ready to start a new craft project on your next Weekend at Home. New Quilt Kits — Make a Beautiful Wall Quilt! Wall Quilts are a wonderful way to add color & creativity to your home. Our selection of Wall Quilt Kits includes a nice variety of quilt design choices you won't want to miss. Complete quilt kits make it easy for you to create a keepsake wall quilt for your home! 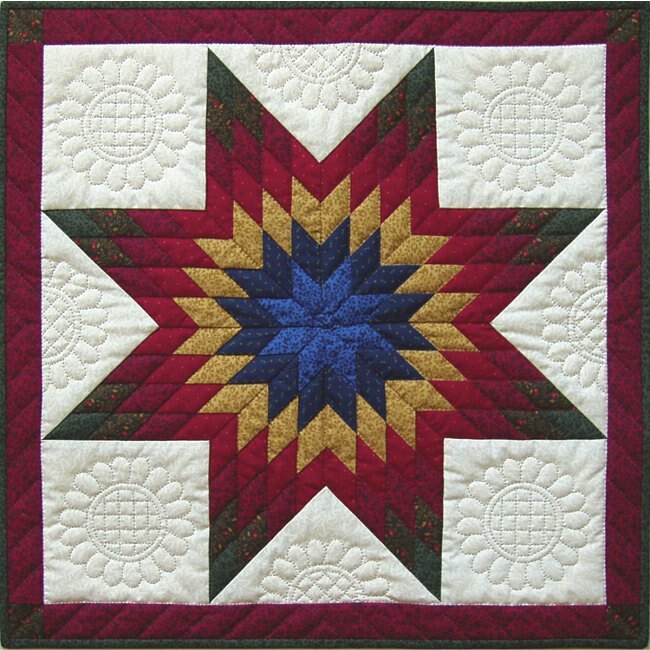 The Lone Star Wall Quilt Kit is a beautiful new quilt pattern & fabric kit from Rachel's of Greenfield. Rachel's quilt kits include all the fabrics you need to complete the entire quilt, including the quilt top, the backing, and the binding. All fabrics are 100% cotton quilt shop quality materials. Adequate amounts of each fabric are included. Warm shades of blue, gold, red, and green are used to make the classic Lone Star design. The contrasting cream color used for the background creates a dramatic effect. The finished size is approx. 22" x 22". Perfect for creative wall display or table top decor! 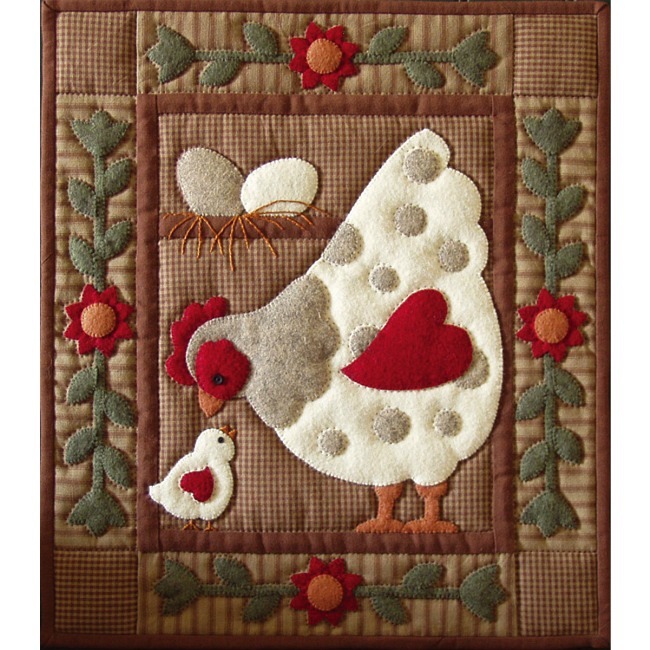 The Spotty Hen Wall Quilt Kit is a new Applique Quilt pattern & fabric kit from Rachel's of Greenfield. 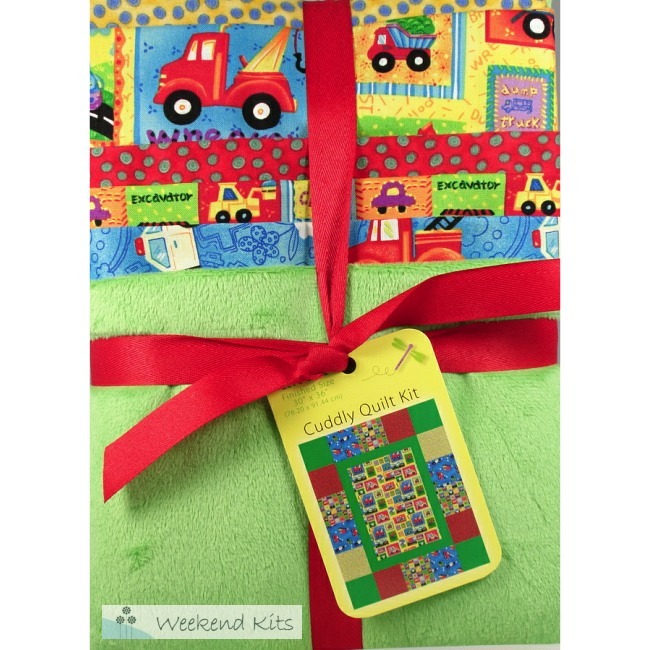 This quilt kit includes quality wool felt materials for the applique pieces. 100% Cotton fabrics are used for the background, borders, backing, and binding. Batting, buttons for eyes, and embroidery floss are also included! Finished size is approx. 13" x 15". Rachel's Quilt Kits include complete step-by-step instructions with diagrams, precise patterns, quilting designs, and embellishments. Quilt kits make quilting easy & convenient for beginners and busy quilters. Find the supplies you need to complete your quilt projects in the Quilting Supplies section of the store. Visit the Quilt Kits section to see our entire selection of quilt kits, including baby quilt kits, lap quilt kits, wall quilt kits, and more! 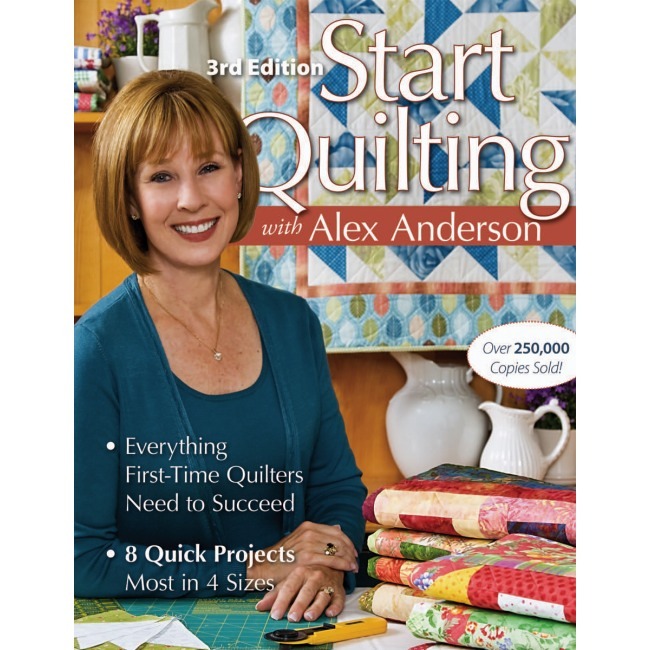 If you're new to quilting, consider purchasing a good basic quilting book for beginners, such as Start Quilting with Alex Anderson. Alex answers many of the questions beginners have when working on their first quilting project. 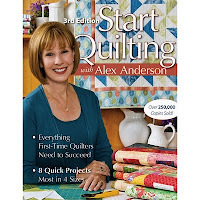 Alex Anderson's Hand & Machine Applique book is a good choice if you're interested in learning how to make applique quilts. At Weekend Kits, we believe learning a new craft should be easy & fun! We'll be adding new Creative Craft Kits to the store throughout the year, so be sure to check back often for new product arrivals. Stop by today and be ready to learn a new craft on your next Weekend at Home. Thanks for visiting the Weekend Kits Blog!